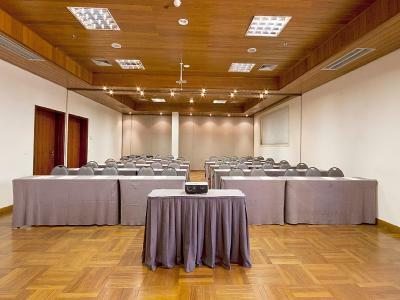 Lock in a great price for Comfort Suites Brasília – rated 8.7 by recent guests! excellent location, room with space and comfy bed. breakfast well served. I recommend. 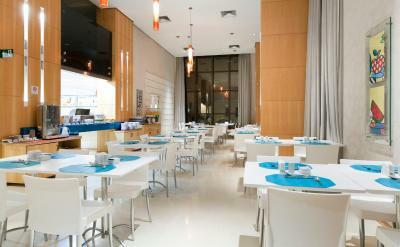 Excelent location, friendly staff and great breakfast. Everything and everyone was great. Service was excellent. This was our second stay. Room was compact but good - comfy mattress and pillows, good shower, good furniture. Breakfast is well assorted, staff is attentive. Cleanliness and maintenance. Very pleasant swimming pool area. 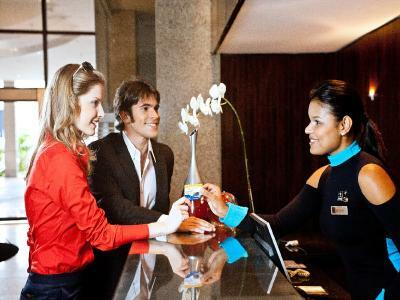 The overall experience was great....I use Comfort Inns and Suites quite a lot in my travels and here in Brasilia our expectations were exceeded just like all the hotels worldwide...A great experience. 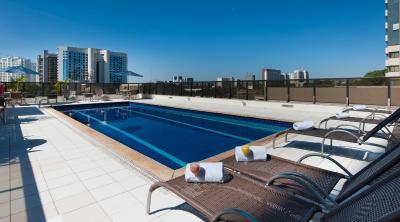 The hotel is within walking distance to the city center, very close to the TV tower, in a quiet street. 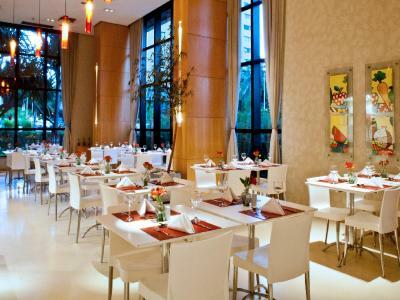 In front of the hotel there is a chain store with many restaurants. My room was spacious and clean, WiFi worked well, the bathroom was ok (but not excellent)); AC is a bit noisy (but in the evening there was no need to switch it on). Breakfast is excellent, with an impressive variety of food. Nice and helpful staff. 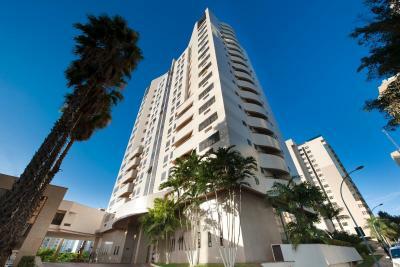 Great location opposite a nice shopping mall with good restaurants. Would be great to have some tea/coffee in the room, and the entry to the swimming pool needs some repair. 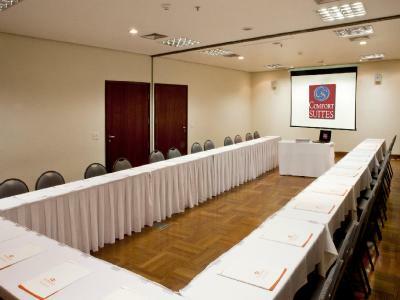 Comfort Suites Brasília This rating is a reflection of how the property compares to the industry standard when it comes to price, facilities and services available. It's based on a self-evaluation by the property. Use this rating to help choose your stay! 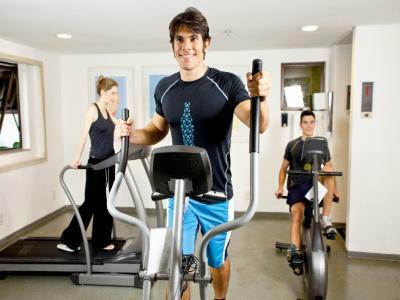 One of our top picks in Brasília.Comfort Suites Brasília offers nonsmoking rooms, a sauna, an on-site restaurant and a well-equipped fitness center, only 0.6 mi from Mane Garrincha Stadium. Free WiFi is available in all rooms. 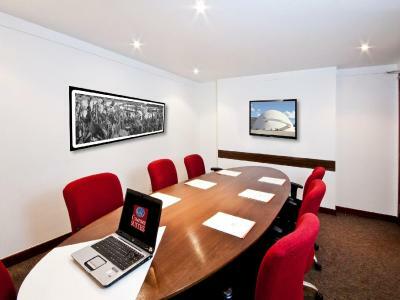 Comfort Brasília provides soundproofed and air-conditioned rooms which have a flat-screen TV with cable channels and a DVD player. 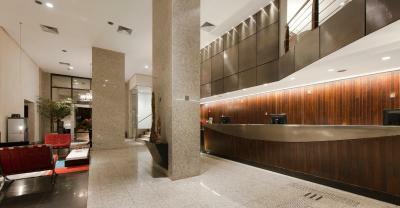 Extras include a mini-bar and tea and coffee making facilities. 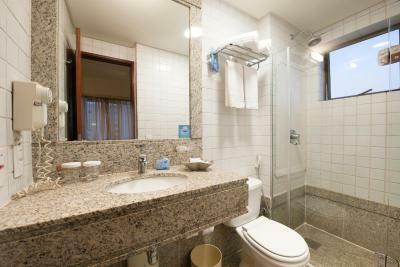 Bathrooms are private and include a hairdryer and free toiletries. 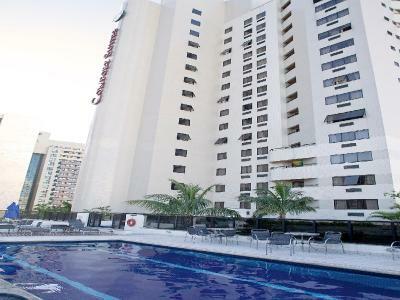 Guests can relax with a swim in the hotel’s swimming pool or try out one of the tropical cocktails offered by the lobby bar. Comfort Suites Brasília is a 3.7 mi to Esplanada dos Ministérios. Brasília International Airport is less than 8.7 mi away. 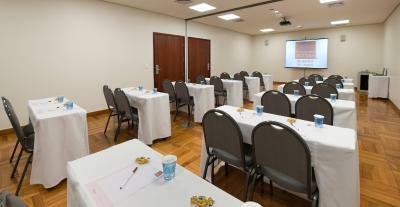 When would you like to stay at Comfort Suites Brasília? With a queen bed, this room features a minibar, cable TV, safe and work desk. Some feature a balcony. Free Wi-Fi is available. Private parking is available on site (reservation is not needed) and costs BRL 11.50 per day. Including a queen bed, this room features a minibar, cable TV, a safe and a work desk. Free Wi-Fi is available. 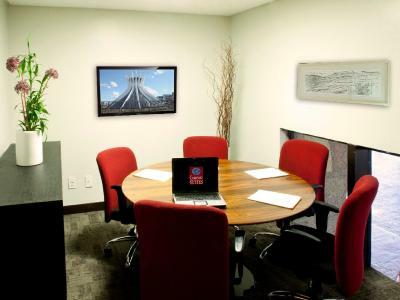 This room features a minibar, cable TV, a safe and a work desk. Free Wi-Fi is available. 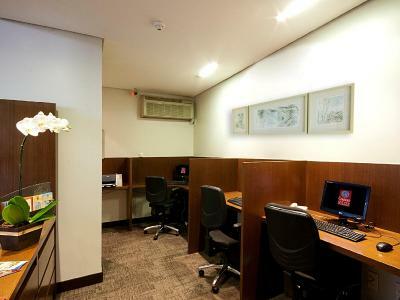 This room features a minibar, cable TV, safe and work desk. Some feature a balcony. Free Wi-Fi is available. This luxurious suite features a 32-inch LCD cable TV, a minibar and an iPod docking station. Guests can choose from a pillow menu. Free Wi-Fi is available. 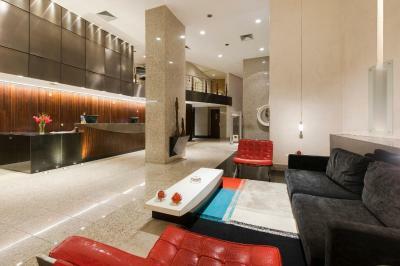 House Rules Comfort Suites Brasília takes special requests – add in the next step! Comfort Suites Brasília accepts these cards and reserves the right to temporarily hold an amount prior to arrival. The total cost of the room doesn't include the City Tax and service charge. These fees will be charged directly at the hotel. Generally very poor internet. I had to go to reception to send important mails. Apparently there was a problem. Comfy bed. Good swimming pool. Beds are very uncomfortable and noisy, you have to pay for car park, checkout was too long , we had to wait 20 minutes before being served as there was only one person at reception, meaning we were late for our flight. The fact that they charge extra if the guest wants a different kind of eggs other than scrambled. I have an allergy to milk so, was able to get eggs without milk, apparently. Although they looked quite creamy. Bedroom could be less noisy.